See the page on styles and titles of the British royal family and the relevant files from the National Archives. This page presents original documents relating to styles and titles of the British royal family (see the general discussion). The first part of this page contains official grants and decisions on styles and titles issued by the sovereign in any form (letters patent, warrants, etc). First, general grants are presented (that is, grants that apply to classes of people); then, individual grants (that is, grants that apply to one or more named individual and possibly their issue). Finally, some documents are presented concerning relatives of the Royal family who were not necessarily considered part of the Royal family but received special treatment: the Tecks, Battenbergs, and Gleichens. The second part presents evidence of official usage (usage in official documents, particularly documents emanating from or signed by the sovereign) for certain individuals: the descendants of the duke of Cumberland (royal family of Hanover from 1837), and the successive princes of Wales (from 1716 to the present prince). The third part collects warrants relating to the heraldry of members of the British royal family. In almost every instance, the text I reproduce is the actual warrant or letters patent. The full text of these documents is rarely published, and I have reproduced either the original document or certified copies found in the National Archives or in the records of the College of Arms (reproduced with kind permission of the College). Usually, a grant or decision is gazetted in the London Gazette, and some report will also appear in the Times. Although the texts sent to the Gazette were drafted and reviewed in the Home Office, the announcement is an abridgement of the original document, usually omitting the preamble and sometimes differing in the exact wording of the dispositive part. Occasionally, however, the Gazette announcement conveys additional information that is not in the letters patent (for example, in 1957, the Queen's wishes as to the manner in which her husband should be designated). Therefore, I have also reproduced the Gazette or Times announcements, indented to the right. It should be noted that the by-line date under which the document is gazetted is not necessarily the same as the date of the document itself. Sometimes, the announcement specifies the date of the document (e.g., 'by Letters Patent dated ..."), but oftentimes it doesn't. See a picture of the original letter patents (Credit: The National Archives, ref. HO125/1). Victoria by the Grace of God of the United Kingdom of Great Britain and Ireland Queen Defender of the Faith To all to Whom these presents shall come Greeting : Whereas we taking into our Royal consideration that the Princes and Princesses of Our Royal Family descended from and in lineal succession to the Crown as now established by law all bear the style and title of Highness but that it has not been declared or defined by due authority what members of the Royal Family (other than the Children of the Sovereign) are entitled to the style of “Royal Highness”. We deem it therefore expedient that the same should be henceforth established defined and limited in manner hereinafter declared: Know Ye therefore that in the exercise of Our Royal and undoubted Prerogative and of Our Especial grace We do hereby declare our Royal Will and Pleasure that besides the Children of the Sovereign of these Realms the Children of the Sons of any Sovereign of Great Britain and Ireland shall have and at all times hold and enjoy the style title or attribute of “Royal Highness” with their titular dignity of Prince or Princess prefixed to their respective Christian names or with their other titles of Honor: Our Will and Pleasure further is that Our Earl Marshal of England or his Deputy for the time being do cause these our Letters Patent or the Enrolment thereof to be recorded in the College of Arms to the end that our Officers of Arms and all others may take due notice thereof. In Witness whereof We have caused these Our Letters to be made Patent. Witness Ourself at Westminster the thirtieth day of January in the twenty seventh year of Our Reign. By Warrant under the Queen's Sign Manual. The Queen has been pleased by letters patent under the Great Seal, to declare her Royal will and pleasure that, besides the children of the Sovereigns of these realms, the children of the sons of any Sovereign of Great Britain and Ireland shall have, and at all times hold and enjoy, the style, title or attribute of Royal Highnes with their titular dignity of Prince or Princess prefixed to their respective christian names, or with their other titles of honour; and further to declare her will and pleasure that the Earl Marshal of England, or his Deputy for the time being, do cause the said letters patent to be recorded in Her Majesty's College of Arms to the end that the officers of arms, and all others, may take due notice thereof. Victoria by the Grace of God of the United Kingdom of Great Britain and Ireland Queen Defender of the Faith To all to whom these presents shall come, Greeting: Whereas by virtue of Our Letters Patent dated the thirtieth of January one thousand eight hundred and sixty four wherein We declared Our Royal will and pleasure in that behalf the children of the sons of any Sovereign of Great Britain and Ireland are entitled to the style of "Royal Highness" Know Ye that in the exercise of our Royal and undoubted prerogative and of Our especial grace We do hereby declare our further Royal will and pleasure that the children of the eldest son of any Prince of Wales shall have and at all times hold and enjoy the style title or attribute of "Royal Highness" in addition to such titular dignity of Prince or Princess prefixed to their Christian names or other titles of honour if any as they may otherwise possess Our will and pleasure further is that Our Earl Marshal of England or his deputy for the time being do cause these our Letters Patent or the enrolment thereof to be recorded in Our College of Arms to the end that Our officers of Arms and all others may take due notice thereof. In Witness whereof we have caused these Our Letters to be made Patent.. Witness Ourself etc. The Queen has been pleased by letters patent under the Great Seal, to declare that the children of the eldest son of any Prince of Wales shall have, and at all times hold and enjoy, the style, title, and attribute of "Royal Highness". An earlier draft of the letters patent contained the words, after "otherwise possess" : "and that the title of "Highness" shall be held and enjoyed by the other great grandchildren of the sovereign". By the KING. A PROCLAMATION declaring that the Name of Windsor is to be borne by his Royal House and Family and Relinquishing the Use of All German Titles and Dignities. And do hereby further declare and announce that We for Ourselves and for and on behalf of Our descendants and all other the descendants of Our said Grandmother Queen Victoria who are subjects of these Realms, relinquish and enjoin the discontinuance of the use of the Degrees, Styles, Dignities, Titles and Honours of Dukes and Duchesses of Saxony and Princes and Princesses of Saxe-Coburg and Gotha, and all other German Degrees, Styles, Dignities. Titles, Honours and Appellations to Us or to them heretofore belonging or appertaining. Given at Our Court at Buckingham Palace, this Seventeenth day of July, in the year of our Lord One thousand nine hundred and seventeen, and in the Eighth year of Our Reign. See a picture of the original letter patents (Credit: The National Archives, ref. HO125/15). George the Fifth by the Grace of God of the United Kingdom of Great Britain and Ireland and of the British Dominions beyond the Seas, King, Defender of the Faith To all to whom these presents shall come Greeting: Whereas Her late Majesty Queen Victoria did by Her Letters Patent dated the thirtieth day of January in the twenty seventh year of Her Reign declare her Royal Pleasure as to the style and title of the Princes and Princesses of the Royal Family in the manner in the said Letters Patent particularly mentioned And whereas we deem it expedient that the said Letters Patent should be extended and amended and that the styles and titles to be borne by the Princes and Princesses of the Royal Family should be henceforth established defined and limited in manner hereinafter declared Now Know Ye that We of our especial grace certain knowledge and mere motion do hereby declare our Royal Will and Pleasure that the children of any Sovereign of these Realms and the children of the sons of any such Sovereign and the eldest living son of the eldest son of the Prince of Wales shall have and at all times hold and enjoy the style title or attribute of Royal Highness with their titular dignity of Prince or Princess prefixed to their respective Christian names or with their other titles of honour And We do further declare our Royal Will and Pleasure that save as aforesaid the style title or attribute of Royal Highness Highness or Serene Highness and the titular dignity of Prince or Princess shall not henceforth be assumed or borne by any descendent of any Sovereign of these Realms excepting always any such descendant who at the date of these Letters Patent holds or bears any right to any such style degree attribute or titular dignity in pursuance of any Letters Patent granted by Ourselves or any of Our Royal Predecessors and still remaining unrevoked it being Our Royal Will and Pleasure that the grandchildren of the sons of any such Sovereign in the direct male line (save only the eldest living son of the eldest son of the Prince of Wales) shall have and enjoy in all occasions the style and title enjoyed by the children of Dukes of these Our Realms Our Will and Pleasure further is that Our Earl Marshal of England or his deputy for the time being do cause these our Letters Patent or the enrolment thereof to be recorded in Our College of Arms to the end that Our officers of Arms and all others may take due notice thereof. In Witness whereof We have caused these Our Letters to be made Patent Witness Ourself at Westminster the thirtieth day of November in the eighth year of Our reign. By Warrant under the King's Sign Manual. The KING has been pleased by Letters Patent under the Great Seal of the United Kingdom of Great Britain and Ireland, bearing date the 30th ultimo, to define the styles and titles to be borne henceforth by members of the Royal Family. It is declared by the Letters Patent that the children of any Sovereign of the United Kingdom and the children of the sons of any such Sovereign and the eldest living son of the eldest son of the Prince of Wales shall have and at all times hold and enjoy the style, title or attribute of Royal Highness with their titular dignity of Prince or Princess prefixed to their respective Christian names or with their other titles of honour; that save as aforesaid the titles of Royal Highness, Highness or Serene Highness, and the titular dignity of Prince and Princess shall cease except those titles already granted and remaining unrevoked; and that the grandchildren of the sons of any such Sovereign in the direct male line (save only the eldest living son of the eldest son of the Prince of Wales) shall have the style and title enjoyed by the children of Dukes. I hereby declare My Will and Pleasure that I and My children shall be styled and known as the House and Family of Windsor, and that My descendants, other than female descendants who marry and their descendants, shall bear the Name of Windsor". Clarence House, April 9th. 1952. The Queen to-day declared in Council Her Will and Pleasure that She and her children shall be styled and known as the House and Family of Windsor, and that Her descendants, shall bear the name of Windsor. (London Gazette, issue 39513, Apr. 11, 1952, p. 1/2013). At the Court at Buckingham Palace, The 8th day of February 1960. Present, the Queen's Most Excellent Majesty in Council. Now therefore I declare My Will and Pleasure that, while I and My Children shall continue to be styled and known as the House and Family of Windsor, My descendants other than descendants enjoying the style, title or attribute of Royal Highness and the titular dignity of Prince or Princess and female descendants who marry and their descendants shall bear the name of Mountbatten-Windsor." Elizabeth the Second by the grace of God and of the United Kingdom of Great Britain and Northern Ireland and of our other realms and territories Queen Head of the Commonwealth Defender of the Faith to all to whom these presents shall come greeting. 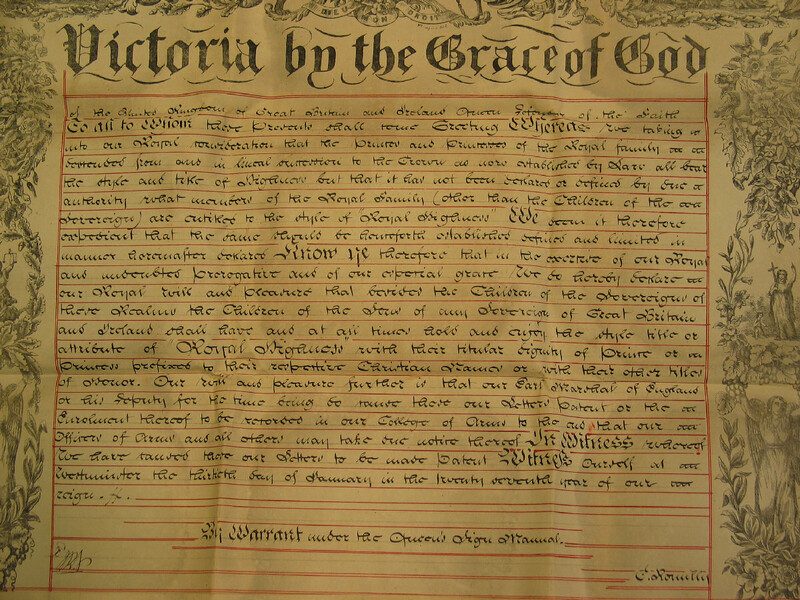 Whereas her late Majesty Queen Victoria by her Letters Patent dated the 30th day of January in the 27th year of her reign did in exercise of her royal prerogative establish define and limit entitlement to the style “Royal Highness” and did declare her royal will and pleasure that certain members of the royal family namely the children of a sovereign of these realms and the children of the sons of a sovereign should have the style title or attribute of royal highness: and whereas her late majesty queen Victoria by her letters patent dated the 27th day of May in the 61th year of her reign did extend and amend the said letters patent by declaring that as well as hereinbefore mentioned the children of the eldest son of the prince of Wales should have the style title or attribute of royal Highness and Whereas His late Majesty King George V by his letters patent dated the 30th day of Nov in the 8th year of his reign did amend the said letters patent by declaring that of the children of the eldest son o the Prince of Wales only he eldest living son of the eldest son of the Prince of Wales should have the style title of attribute of Royal Highness: And Whereas His late Majesty King George VI by his Letters Patent dated the 27th day of May in the 1st year of his Reign did declare that despite his exclusion from the succession the Duke of Windsor should continue to hold and enjoy the style title or attribute of Royal Highness but that his wife and children if any and the children of his sons should not be so entitled: And Whereas by convention the wife of the son of a sovereign of these Realms the wife of a son of a son of a Sovereign and the wife of the eldest living son of the eldest son of the Prince of Wales is entitled to the style title or attribute of Royal Highness: and Whereas We deem it expedient to declare and define by due Authority the entitlement of a former wife (other than a widow until she shall remarry) of a son of a sovereign of these Realms of a son of a son of a Sovereign and of the eldest living son of the eldest son of the Prince of Wales to the style title or attribute of Royal Highness: Now Know Ye that We of our especial Grace certain knowledge and mere motion do hereby declare our royal will and pleasure that a former wife (other than a widow until she shall remarry) of a son of a Sovereign of the Realms of a son of a son of a Sovereign and of the eldest living son of the eldest son of the Prince of Wales shall not be entitled to hold and enjoy the style title or attribute of Royal Highness in Witness whereof we have caused these our Letters to be made Patent witness Ourself at Westminster the 21st day of August in the 45th year of our reign. By warrant under the Queen’s sign manual. (As recorded in the College of Arms, mss I series, vol. 85, p. 61; reproduced with kind permission of the College of Arms). The Queen has been pleased by Letters Patent under the Great Seal of the Realm dated 21st August 1996, to declare that a former wife (other than a widow until she shall remarry) of a son of a Sovereign of these Realms, of a son of a son of a Sovereign and of the eldest living son of the eldest son of The Prince of Wales shall not be entitled to hold and enjoy the style, title or attribute of Royal Highness. The Queen has been pleased by Letters Patent under the Great Seal of the Realm dated 31 December 2012 to declare that all the children of the eldest son of The Prince of Wales should have and enjoy the style, title and attribute of Royal Highness with the titular dignity of Prince or Princess prefixed to their Christian names or with such other titles of honour. In the name and on the behalf of His Majesty. George the third etc. To all to whom these Presents shall come Greeting: Our Will and Pleasure is and We do hereby declare and ordain that from and after the date of this Our Warrant, Our Dear Niece The Princess Sophia Matilda daughter of our late Brother, His Royal Higness William Henry Duke of Gloucester and Edinburgh Earl of Connaught etc shall be styled, entitled and called, "Her Royal Highness" in addition to and before all other styles, titles, and appellation which to Her now do, or at any time hereafter may belong or appertain, in all Deeds, Records, Instruments or Documents whatsoever, wherein she may at any time hereafter be named or described, and we do hereby authorize and empower Our said Dear Niece, henceforth at all time to assume and have, and to be called and and named by the Style Title and Appellation of "Her Royal Highness" accordingly. Given at Our Court at Carlton House the 22nd day of July 1816 in the 56th year of our Reign. George the third etc. To all to whom these Presents shall come Greeting: Our Will and Pleasure is and We do hereby declare and ordain that from and after the date of this Our Warrant, Our Dear Nephew William Frederick Duke of Gloucester and Edinburgh Earl of Connaught, Knight of the Most Noble Order of the Garter &c. son of our late Brother, His Royal Higness William Henry Duke of Gloucester and Edinburgh Earl of Connaught etc shall be styled, entitled and called, "His Royal Highness" in addition to and before all other styles, titles, and appellaton which to Him now do, or at any time hereafter may belong or appertain, in all Deeds, Records, Instruments or Documents whatsoever wherein he may at any time hereafter be named or described, and we do hereby authorize and empower Our said Dear Nephew, henceforth at all time to assume and have, and to be called and and named by the Style Title and Appellation of "His Royal Highness" accordingly. George the third by the Grace of God of the United Kingdom of Great Britain and Ireland, King Defender of the Faith etc. To all to whom these Presents shall come greeting: Our Will and Pleasure is, and we do hereby declare and ordain, that from and after the date of this warrant, Prince Leopold George Frederick of Saxe Cobourg of Saalfeld, late consort our Our Most Dear Grand Daughter the Princess Charlotte Augusta, deceased, shall be styled, entitled and called "His Royal Highness" before his name and such Titles and appellations, which to Him now do, or at any time hereafter may belong or appertain, in all Deeds, Records, Instruments or Documents whatsoever, wherein He may at any time hereafter be named or described. And We do hereby authorize and empower the said Prince Leopold George Frederick henceforth and at all times to assume and use, and to be called and named by the style title and appellation of "His Royal Highness" accordingly. Given at Our Court at Carlton House the Sixth Day of April 1818 in the Fifty Eigth Year of Our Reign. By the Command of His Royal Highness the Prince Regent, in the Name and on the behalf of His Majesty. Sidmouth. Prince Leopold of Saxe-Coburg-Gotha (1790-1865) had been destined to become the consort of Queen Charlotte, the only child and heir of the Prince of Wales (future George IV). The previous consort had been Prince George of Denmark (1653-1708) who, as younger son of king Frederik III of Denmark, was already entitled to the style of Royal Highness (indeed, he outranked his brother-in-law the prince of Orange). Prince George was created duke of Cumberland on March 20, 1689 in gratitude for his role during the Glorious Revolution; he had also been made a Knight of the Garter in 1684. Prince Leopold, a Serene Highness as member of the house of Saxe-Coburg-Gotha, was married on May 2, 1816 with Princess Charlotte of Wales. She died on Nov. 6, 1817 from the complications of giving birth to a stillborn. Prince Leopold remained in London until 1830 when, after turning down the throne of Greece in February, he accepted the throne of Belgium where he reigned as Leopold I. His sister had married the duke of Kent and hence Queen Victoria was his niece. Heraldic note: on April 7, 1818 Prince Leopold was granted the following arms: "Royal arms without escocheon of Charlemagne’s crown and without the Hanoverian Royal crown, differenced with a label of five points argent, the centre point charged with a rose gules … quarterly with the arms of his illustrious house, our royal arms in the first and fourth quarter" (HO38 /19 p. 81). Victoria etc. To all to whom these Presents shall come Greeting Our Will and Pleasure is and We do hereby declare and ordain that from and after the date of this Warrant Our dearly beloved Cousin Francis Albert Augustus Charles Emmanuel Duke of Saxe Prince of Saxe Coburg anf Gotha, Knight of Our Most Noble Order of the Gater, shall be styled entitled and called "His Royal Highness" before his Name and such Titles and appellations which to him now do or at any time hereafter may belong or apperatin in all deeds records instruments or documents whatsoever wherein he may at any time herefater be named or described And We do hereby authorize and empower Our said dearly beloved Cousin Francis Albert Augustus Charles Emmanuel Duke of Saxe Prince of Saxe Coburg anf Gotha, henceforth at all times to assume and use and to be called and named by the style title and appellation of "His Royal Highness". Given at Our Court at Saint James's this Sixth day of February 1840 in the Third Year of Our Reign. Whereas there was this day read at the Board the draught of Letters Patent, conferring upon his Royal Highness Prince Albert the title and dignity of Prince Consort, Her Majesty, having taken the same into consideration, was pleased, by and with the advice of her Privy Council, to approve thereof, and to order, as it is hereby ordered, that the Right Hon. Sir George Grey, Bart. one of her Majesty's principal Secretaries of State, do cause a warrant to be prepared for Her Majesty's signature for passing Letters Patent conformable to the said draught under the Great Seal of Great Britain. PRO 30/22/13C, p. 366: letter from Queen Victoria’s private secretary: memorandum on grant of title of Prince Consort to Albert. June 22, 1857. Victoria by the Grace of God of the United Kingdom of Great Britain and Ireland Queen Defender of the Faith - To all to whom these Presents shall come, Greeting! Our Will and Pleasure is, and We do hereby declare and ordain, that from and after the Date of this Warrant, Our Dear Son in Law, His Grand Ducal Highness the Prince Frederic William Louis of Hesse, Knight of Our Most Noble Order of the Garter, shal lbe styled entitled and called "His Royal Highness: before his Name and such Titles and Appellations which to him now do or at any time hereafter may belong or appertain in all Deeds Records Instruments or Documents whatsoever wherein he may at any time hereafter be named or described, - And We do hereby authorize and empower the saif Prince Frederic William Louis of Hesse henceforth at all times to assume and use and to be called and named by the Style, Title and Appellation of "His Royal Highness" accordingly. Given at Our Court at Saint James's the fifth day of July 1862, In the Twenty sixth Year of Our Reign. Her Majesty has been pleased to signify her intention of conferring the rank of "His Royal Highness" on Prince Louis of Hesse. Prince Ludwig of Hesse (1837-92) was the nephew of grand-duke Ludwig III of Hesse-Darmstadt. He married Princess Alice, Queen Victoria's second daughter, on July 1, 1862. The couple returned to live in Germany, contrary to Victoria's expectation. Ludwig succeeded his uncle as grand-duke Ludwig IV in 1877. Alice died soon after in 1878. Victoria by the Grace of God of the United Kingdom of Great Britain and Ireland Queen Defender of the Faith. To All to whom these Presents shall come Greeting! Our Will and Pleasure is, and We do hereby declare and ordain, that from and after the date of this Warrant, Our Dear future Son-in-law, His Serene Highness Prince Frederic Christian Charles Augustus of Sleswig-Holstein Sonderbourg Augustenbourg, shall be styled entitled and called "His Royal Highness", before his name and such Titles and Appellations which to him now do, or at any time hereafter may belong of appertain in all Deeds Records Instruments or Documents whatsoever, whereing he may at any time hereafter be named or described. And We hereby authorize and empower the said Prince Frederic Christian Charles Augustus of Sleswig-Holstein Sonderbourg Augustenbourg, henceforth at all times to assume and use and to be called and named by the Style Title and Appellation of "His Royal Highness" accordingly. Given at Our Court at Saint James's the Twenty-Ninth Day of June 1866 in the Thirtieth Year of Our Reign. The Queen has ordained that his Serene Highness Prince Frederic Christian Charles Augustus, of Schleswig-Holstein Sonderbourg Augustenbourg, shall henceforth, upon all occasions whatsoever, be styled and called "his Royal Highness" before his name, and such titles as now do or hereafter may belong to him; and to command that the said Royal concession and declaration be registered in Her Majesty's College of Arms. Times, Jul 4, 1866, p. 4F, quoting the London Gazette, July 3. Victoria by the Grace of God of the United Kingdom of Great Britain and Ireland Queen Defender of the Faith - To Our Right Trusty and Well beloved Councillor Edward George Fitzalan Howard (commonly called Lord Edward George Fitzalan Howard) Deputy to Our Right Trusty and Right Entirely Beloved Cousin Henry Duke of Norfolk Earl Marshal and Our Hereditary Marshal of England, Greeting! Whereas by Letters Patent under the Great Seal of the United Kingdom bearing date the thirtieth day of January one thousand eight hundred and sixty four We were pleased to declare Our Royal Will and Pleasure touching the Style and Title of "Royal Highness" and of defining and limiting the same to be used and enjoyed by the Children of the Sons of any Sovereign of Great Britain and Ireland and upon the thirtieth day of June one thousand eight hundred and sixty six in contemplation of the marriage of Our dear Daughter the Princess Helena Augusta Victoria with the Prince Christian of Schleswig Holstein We were pleased to declare that he should henceforth be styled "His Royal Highness". And Whereas he the said Prince having since become a naturalized subject of Our said United Kingdom We are desirous of defining and fixing the Style by which the Issue of the said Marriage shall be designated such Issue being British born Subjects and Descendants of Our Royal House Now We are hereby pleased to declare that the Sons and Daughters born of the said Marriage of the said Prince and Princess shall at all times hold and enjoy the Style Title and Attribute of "Highness" prefixed to their respective Christian names and any Titles of Honor which may belong to them. And Our Will and Pleasure further is that you Our said Deputy Earl Marshal to whom the cognizance of matters of this nature doth properly belong do see this Our Order kept and that the same be duly Registered in Our College of Arms to the end that Our Officers of Arms and all others upon occasion may take full notice and have knowledge thereof. In Witness whereof We have caused the Great Seal to be affixed to these Presents. Given at Our Court at Saint Jame's the Fifteenth day of May 1867, in the Thirtieth Year of Our Reign. By the Queen of the United Kingdom of Great Britain and Ireland. Signed with Her Own Hand. See the note on the Schleswig-Holsteins. Victoria by the grace of God of the United Kingdom of Great Britain and Ireland Queen Defender of the Faith. To all to whom these Presents shall come Greeting! Our will and Pleasure is and We do hereby Declare and Ordain that from and after the date of this Warrant Our dear future son-in-law His Serene Highness Prince Henry Maurice of Battenberg shall be styled entitled and called "His Royal Highness" before his name and such Titles and Appellations which to him now do or at any time hereafter may belong or appertain in all Deeds Records Instruments or Documents whatsoever wherein he may at any time hereafter be named or described. And We do hereby authorize and empower the said Prince Henry Maurice of Battenberg henceforth at all times to assume and use and to be called and named by the Style and Appellation of "His Royal Highness" accordingly. Given at Our Court at Saint James's the 22nd day of July 1885 in the 49th year of Our Reign. The Queen has been pleased to declare and ordain that his Serene Highness Prince Henry Maurice of Battenberg shall henceforth, upon all occasions whatsoever, be styled and called "his Royal Highness" before his name, and such titles as now do or hereafter may belong to him; and to command that the said Royal concession and declaration be registered in Her Majesty's College of Arms. See the note on the Battenbergs. Victoria by the Grace of God of the United Kingdom of Great Britain and Ireland Queen Defender of the Faith - To Our Right Trusty and Right Entirely Beloved Cousin Henry Duke of Norfolk Earl Marshal and Our Hereditary Marshal of England, Greeting! Whereas by Letters Patent under the Great Seal of the United Kingdom bearing date the thirtieth day of January one thousand eight hundred and sixty four We were pleased to declare Our Royal Will and Pleasure touching the Style and Title of "Royal Highness" and of defining and limiting the same to be used and enjoyed by the Children of the Sons of any Sovereign of Great Britain and Ireland and upon the twenty second day of July one thousand eight hundred and eighty five in contemplation of the marriage of Our dear Daughter the Princess Beatrice Mary Victoria Feodore with the Prince Henry Maurice of Battenberg We were pleased to declare that he should henceforth be styled "His Royal Highness". And Whereas he the said Prince having since become a naturalized subject of Our said United Kingdom We are desirous of defining and fixing the Style by which the Issue of the said Marriage shall be designated such Issue being British born Subjects and Descendants of Our Royal House Now We are hereby pleased to declare that the Sons and Daughters born of the said Marriage of the said Prince and Princess shall at all times hold and enjoy the Style Title and Attribute of "Highness" prefixed to their respective Christian names and any Titles of Honor which may belong to them. And Our Will and Pleasure further is that you Our said Deputy Earl Marshal to whom the cognizance of matters of this nature doth properly belong do see this Our Order kept and that the same be duly Registered in Our College of Arms to the end that Our Officers of Arms and all others upon occasion may take full notice and have knowledge thereof. In Witness whereof We have caused the Great Seal to be affixed to these Presents. Given at Our Court at Saint Jame's the Fourth day of December 1886, in the Fiftieth Year of Our Reign. The Queen has been pleased, under Her Majesty's Royal Sign Manual and the Great Seal, to declare her Royal will and pleasure that the sons and daughters born of the marriage of his Royal Highness Prince Henry Maurice of Battenberg with Her Royal Highness Princess Beatrice Mary Victoria Feodore shall at all times hold and enjoy the style, title and attribute of "Highness" prefixed to their respective Christian names or any titles of honour which may belong to them; and further to declare Her will and pleasure that the Earl Marshal of England do see this declaration kept, and cause the same to be duly registered in Her Majesty's College of Arms, to the end that the officers of arms, and all others upon occasion, may take full notice and have knowledge thereof. Victoria by the Grace of God of the United Kingdom of Great Britain and Ireland Queen Defender of the Faith - To all to whom these Presents shall come, Greeting ! Our Will and Pleasure is and we do hereby declare and ordain that from and after the date of this Warrant His Serene Highness Francis Paul Charles Louis Alexander Duke of Teck shall be styled entitled and called "His Highness" before her name and such Titles and Appellations which to him now do or at any time hereafter may belong or appertain, in all Deeds, Records, Instruments or Documents whatsoever wherein she may at any time hereafter be named or described. And We do hereby authorize and empower the said Francis Paul Charles Louis Alexander Duke of Teck henceforth at all times to assume and use and to be called and named by the Style, Title and Appellation of "His Highness" accordingly. Given at Our Court of Saint James's, the First day of July 1887; in the Fifty First Year of Our Reign. The Queen has been pleased to declare and ordain that his Serene Highness Francis Paul Charles Louis Alexander, Duke of Teck, shall henceforth, upon all occasions whatsoever, be styled and called "his Highness" before his name, and such titles as now do or hereafter may belong to him; and to command that the said Royal concession and declaration be registered in Her Majesty's College of Arms. See the note on the Tecks. Edward the Seventh by the Grace of God of the United Kingdom of Great Britain and Ireland and of the British Dominions beyond the Seas King, Defender of the Faith To Our Right Trusty and Right Entirely Beloved Cousin Henry Duke of Norfolk, Knight of Our Most Noble Order of the Garter, Knight Grand Cross of Our Royal Victorian Order, Earl Marshal and Our Hereditary Marshal of England, Greeting! Whereas We are desirous of defining and fixing the style by which Our dear Daughter Her Royal Highness the Princess Louise Victoria Alexandra Dagmar (Duchess of Fife) shall be designated We are pleased to declare that she shall hereafter be styled Her Royal Highness the Princess Royal And Whereas by Letters Patent under the Great Seal of the said United Kingdom bearing date the thirtieth day of January one thousand eight hundred and sixty four her late Majesty Queen Victoria were pleased to declare Her Royal Will and Pleasure touching the Style and Title of "Royal Highness" and of defining and limiting the same to be used and enjoyed by the Children of the Sons of any Sovereign of Great Britain and Ireland; And Whereas We are also desirous of defining and fixing the style and title by which the Children of Our said dear Daughter shall be designated : Now We are hereby pleased to declare that the Lady Alexandra Victoria Alberta Edwina Louise Duff and the Lady Maud Alexandra Georgina Bertha Duff daughters of Our said dear Daughter Her Royal Highness The Princess Royal shall at all times hold and enjoy the style title and attribute of Highness prefixed to such respective styles or titles of Honour as may belong to them and further to declare that Our said dear Grand-daughters shall bear the style of Princess prefixed to their respective Christian names and shall take hold and enjoy during the term of their natural lives in all Assemblies or Meetings whatsoever the Precedence and Rank following that is to say immediately after all Members of Our Royal Family enjoying the style of Royal Highness: Our Will and Pleasure further is that you Our said Earl Marshal to whom the cognizance of matters of this nature doth properly belong do see this Our Order kept and that the same be duly Registered in Our College of Arms to the end that Our Officers of Arms and all others upon occasion may take full notice and have knowledge thereof. In Witness whereof We have caused the Great Seal to be affixed to these Presents. Given at Our Court at Buckingham Palace the Ninth day of November One thousand nine hundred and five, in the Fifth Year of Our Reign. By the King of the United Kingdom of Great Britain and Ireland and of the British dominions beyond the seas. Signed with His Own Hand. The KING has been graciously pleased to declare that His Majesty's eldest Daughter, Her Royal Highness Princess Louise Victoria Alexandra Dagmar (Duchess of Fife), shall henceforth bear the style and title of Princess Royal. His Majesty has also directed that the Daughters of Her Royal Highness shall bear the style, title, and attribute of Highness, and also the style of Princess prefixed to their respective Christian names, and that they shall have precedence and rank immediately after all members of the Royal Family enjoying the style of Royal Highness. The Princess Royal was Edward VII's eldest daughter Louise (1867-1931). On July 27, 1889 she married Alexander Duff (1849-1912), earl of Fife (peerage of Ireland, cr 1759, and peerage of the UK, cr 1885). He was created duke of Fife in 1889 with the usual remainder to heirs male. They only had two daughters, Alexandra (1891-1959), who married in 1913 Prince Arthur of Connaught, and Maud (1893-1945), who married in 1923 the earl of Southesk. In 1900, another dukedom of Fife was created with remainder (in default of heirs male) to Alexandra and her heirs male and then Maud and her heirs male. Alexandra's only son Alastair Arthur died before her in 1943, and the dukedom of Fife passed at her death to Maud's only son James Carnegie, the present duke of Fife. Edward the Seventh by the Grace of God of the United Kingdom of Great Britain and Ireland and of the British Dominions beyond the Seas King, Defender of the Faith To all to whom these Presents shall come, Greeting! Our Will and Pleasure is and we do hereby declare and ordain that from and after the date of this Warrant our most Dear Niece Princess Victoria Eugénie Julia Ena, only daughter of Our most Dear Sister Beatrice Mary Victoria Feodore (Princess Mary of Battenberg) shall be styled entitled and called "Her Royal Highness" before her name and such Titles and Appellations which to her belong in all Deeds Records Instruments or Documents whatsoever wherein she may at any time hereafter be named or described. And We do hereby authorize and empower Our said most Dear Niece henceforth at all times to assume and use and to be called and named by the Style, Title and Appellation of "His Royal Highness" accordingly. Given at Our Court of Saint James's, the Third day of April 1906: in the Sixth Year of Our Reign. The King has been graciously pleased to declare and ordain that His Majesty's niece, Her Highness Princess Victoria Eugénie Julia Ena, daughter of Her Royal Highness the Princess Beatrice Mary Victoria Feodore (Princess Henry of Battenberg), shall henceforth be styled and called "her Royal Highness"; and to command that the said Royal concession and declaration be registered in His Majesty's College of Arms. Victoria Eugenie married Alfonso XIII, king of Spain, on May 31, 1906 in Madrid. George the Fifth by the Grace of God of the United Kingdom of Great Britain and Ireland and of the British Dominions beyond the Seas King, Defender of the Faith, Emperor of India, To all to whom these Presents shall come, Greeting! Our Will and Pleasure is and we do hereby declare and ordain that from and after the date of this Warrant His Serene Highness Prince Adolphus Charles Alexander Albert Edward George Philip Louis Ladislaus, Duke of Teck, Knight Grand Cross of Our Royal Victorian Order, Companion of Our Most Distinguished Order of Saint Michael and Saint George, shall be styled entitled and called "His Highness" before his name and such Titles and Appellations which to him now do or at any time hereafter may belong or appertain, in all Deeds, Records, Instruments or Documents whatsoever, wherein he may at any time hereafter be named or described. And We do hereby authorize and empower the said Prince Adolphus Charles Alexander Albert Edward George Philip Louis Ladislaus, Duke of Teck, henceforth at all times to assume and use and to be called and named by the Style, Title and Appellation of "His Highness" accordingly. Given at Our Court of Saint James's, the Nineteenth day of June 1911, in the Second Year of Our Reign. The King has been pleased, by Warrant under His Majesty's Royal Sign Manual, bearing date the 19th June, to declare and ordain that from and after the date of the said Royal Warrant His Serene Highness Prince Adolphus Charles Alexander Albert Edward George Philip Louis Ladislaus, Duke of Teck, GCVO, GMC, shall upon all occasions whatsoever be styled and called "His Highness" before his name and such titles as now do or hereafter may, belong to him. George the Fifth by the Grace of God of the United Kingdom of Great Britain and Ireland and of the British Dominions beyond the Seas King, Defender of the Faith To Our Right Trusty and Right Entirely Beloved Cousin and Counsellor Henry Duke of Norfolk, Knight of Our Most Noble Order of the Garter, Knight Grand Cross of Our Royal Victorian Order, Earl Marshal and Our Hereditary Marshal of England, Greeting ! Now Know Ye that we do hereby declare and ordain that the children born to their Royal Highnesses the Duke and Duchess of Brunswick and Lüneburg shall at all times hold and enjoy the style and attribute of "Highness" with their titular dignity of Prince or Princess prefixed to their respective Christian names, or with any titles of honour which may belong to them. And we do hereby further declare and ordain that the designation of the said children shall be "a Prince (or Princess) of the United Kingdom of Great Britain and Ireland". Our Will and Pleasure further is that you Our said Earl Marshal to whom the cognizance of matters of this nature doth properly belong do see this Our Order kept and that the same be duly Registered in Our College of Arms to the end that Our Officers of Arms and all others upon occasion may take full notice and have knowledge thereof. In Witness whereof We have caused Our Great Seal to be affixed to these Presents. Given at Our Court at Saint Jame's the Seventeenth day of June, 1914: in the Fifth Year of Our Reign. By the King of the United Kingdom of Great Britain and Ireland and of the British Dominions beyond the Seas. Signed with His Own Hand. The King has been pleased to declare and ordain that the children born to their Royal Highnesses the Duke and Duchess of Brunswick and Lüneburg shall at all times hold and enjoy the style and attribute of 'Highness' with their titular dignity of Prince or Princess prefixed to their respective Christian names, or with any titles of honour which may belong to them; and that the designation of the said children shall be a Prince (or Princess) of the United Kingdom of Great Britain and Ireland. And to command that the said Royal concession and declaration be registered in His Majesty's College of Arms." The London Gazette announces that the King has been pleased to ordain that the children born to their Royal Highnesses the Duke and Duchess of Brunswick and Lüneburg shall enjoy the style of "Highness" with their titular dignity of Prince or Princess prefixed to their respective Christian names, or with any titles of honour which may belong to them; and that the designation of the said children shall be "a Prince (or Princess) of the United Kingdom of Great Britain and Ireland". They were not affected in any way by the Titles Deprivation Act of 1917. The King has been pleased to direct that Royal Warrants shall be prepared declaring that Their Highnesses Princess Helena Victoria and Princess Marie Louise of Schleswig-Holstein shall henceforth be styled Their Highnesses Princess Helena Victoria and Princess Marie Louise respectively, and whereas the Princesses of the Royal Family who bear the Title of Duchess of Saxony and who are his Subjects have, at His Majesty's desire, relinquished the said Title, he has also been pleased to direct that Royal Warrants shall be prepared declaring their present styles and making such corresponding alteration in their arms as may be necessary. I have not found trace of a warrant for the princesses in the London Gazette or in the Warrant Books at the National Archives; nor are any recorded in the College of Arms, mss series I. WHEREAS Our Most Dear Cousin Her Royal Highness Victoria Patricia Helena Elizabeth, Princess of Great Britain and Ireland bath by her Petition humbly represented unto us That a marriage has been agreed upon and is shortly to be had and solemnized between the Petitioner and Alexander Robert Maule Ramsay (commonly called the Honourable Alexander Robert Maule Ramsay ) Companion of the Distinguished Service Order, Commander in Our Royal Navy: That the Petitioner is desirous of relinquishing the style of Royal Highness and the title of Princess of Great Britain and Ireland, the Petitioner therefore most humbly prays Our Royal Licence and Autthority that she may immediately on and from the solemnization the said intended marriage relinquish the style of Royal Highness and the title of Princess of Great Britain and Ireland. Our Will and Pleasure therefore is that you Edmund Bernard Talbot (commonly called Lord Edmund Bernard Talbot) deputy to Our said Earl Marshal, to whom the cognizance of matters of this nature doth properly belong do require and command Concession and Declaration be recorded in Our College of Arms to the end that our Officers of Arms and all others upon occasion may take full notice and have knowledge thereof, and for so doing this shall be your Warrant. pander in Our Royal Navy. WHEREAS We having taken the wishes of Our said Most Dear Cousin into Our Royal Consideration and in exercise of Our Royal Prerogative We do hereby declare Our Royal Will and Pleasure that Our said Most Dear Cousin shall immediately on and from the solemnization of the said intended marriage have hold and enjoy the style of Lady Victoria Patricia Helena Elizabeth Ramsay and all have place preeminence and precedence immediately before that of Marchionesses of England. Our Will and Pleasure therefore is that you Edmund Bernard Talbot (commonly called lord Edmund Bernard Talbot) Deputy to Our said Earl Marshal, to whom the cognizance of matters of this nature doth properly belong do see this Our Order observed and kept and that you do cause these Presents to be registered in Our College of Arms. And for so doing this shall be your Warrant. Given at Our Court at Saint James's this Twenty-fifth day of February 1919 in the Ninth year of Our Reign. The king has been graciously pleased, by Warrant under His Majesty's Sign Manual, to give and grant unto Her Royal Highness Victoria Patricia Helena Elizabeth, Princess of Great Britain and Ireland, His Royal License and Authority that she may immediately on and from the solemnization of her intended marriage with Alexander Robert Maule Ramsay (commonly called the Honourable Alexander Robert Maule Ramsay), Companion of the Distinguished Service Order, Commander in the Royal Navy, relinquish the style of Princess of Great Britain and Ireland. And to command that the said Royal Concession and Declaration be recorded in His Majesty's College of Arms. The king has been graciously pleased, by Warrant under His Majesty's Sign Manual, to declare and ordain that Her Royal Higness Princess Victoria Patricia Helena Elizabeth shall immediately on and from the solemnization of her intended marriage with Alexander Robert Maule Ramsay (commonly called the Honourable Alexander Robert Maule Ramsay), Companion of the Distinguished Service Order, Commander in the Royal Navy, have, hold and enjoy the style of Lady Victoria Patricia Helena Elizabeth Ramsay, and shall have place, pre-eminence and precedence immediately before Marchionesses of England. HRH Princess Victoria Patricia was a daughter of the duke of Connaught. By royal warrant of Mar 21, 1919 she was assigned the royal arms "differenced by a label of 5 points argent 1st and 5th charged with St George cross and each of the other points with a fleur de lis azure" , and a badge consisting of "the letters PR encircled by a coronet composed of crosses and strawberry leaves", that is, the coronet of her former rank (College of Arms, mss series I, vol. 78, p. 91; with kind permission of the College of Arms). See also documents relating to the drafting of these letters patent. Whitehall, May 28, 1937.The KING has been pleased by Letters Patent under the Great Seal of the Realm bearing date the 27th day of May, 1937, to declare that the Duke of Windsor shall, notwithstanding his Instrument of Abdication executed on the loth day of December, 1936, and His Majesty's Declaration of Abdication Act, 1936, whereby effect was given to the said Instrument, be entitled to hold and enjoy for himself only the title style or attribute of Royal Highness so however that his wife and descendants if any shall not hold the said title style or attribute. GEORGE THE SIXTH by the Grace of God of Great Britain Ireland and the British Dominions beyond the Seas King Defender of the Faith To all to whom these Presents shall come Greeting Know Ye that in the exercise of Our Royal and undoubted prerogative and of Our especial grace We do by these Presents declare Our Royal Will and Pleasure that Our most dear and beloved Cousin SIR PHILIP MOUNTBATTEN Knight of Our Most Noble Order of the Garter Lieutenant in Our Navy shall have and at all times hold and enjoy the style title or attribute of ROYAL HIGHNESS in addition to any other appellations and titles of honour which to him belong or at any time hereafter may belong And We do hereby authorize and empower the said Sir Philip Mountbatten henceforth at all times to assume and use and to be called and named by the style title or attribute of His Royal Highness accordingly Our Will and Pleasure further is that Our Earl Marshal of England or his Deputy for the time being do cause these Our Letters Patent or the enrolment thereof to be recorded in Our College of Arms to the end that Our Officers of Arms and all others may take due notice thereof In Witness whereof We have caused these Our Letters to be made Patent Witness Ourself at Westminster the nineteenth day of November in the eleventh year of Our Reign. The KING has been pleased by Letters Patent under the Great Seal of the Realm, bearing date the 19th instant, to declare that Lieutenant Sir Philip Mountbatten, K.G., R.N., shall be entitled to hold and enjoy the style, title and attribute of Royal Highness. Note: he was created duke of Edinburgh by letters patent of the following day, gazetted in the same issue. The KING has been pleased by Letters Patent under the Great Seal of the Realm bearing date the 22nd ultimo to define and fix the style and title by which the children of the marriage solemnized between Her Royal Highness The Princess Elizabeth, Duchess of Edinburgh and His Royal Highness Prince Philip, Duke of Edinburgh, shall be designated. It is declared by the Letters Patent that the children of the aforesaid marriage shall have and at all times hold and enjoy the style title or attribute of Royal Highness and the titular dignity of Prince or Princess prefixed to their respective Christian names in addition to any other appellations and titles of honour which may belong to them hereafter. ELIZABETH THE SECOND By the Grace of God of the United Kingdom of Great Britain and Northern Ireland and of Our other Realms and Territories Quen Head of the Commonwealth Defender of the Faith To all to whom these Presents shall come Greeting WHEREAS in testimony of the great love which We bear towards Our most dearly beloved Husband and most faithful Counsellor His Royal Highness Philip Duke of Edinburgh Knight of our Most Noble Order of the Garter Knight of Our Most Ancient and Most Noble Order of the Thistle Grand Master and First or Principal Knight Grand Cross of Our Host Excellent Order of the British Empire Admiral of Our Fleet And being sensible of the high regard and affection in which he is held by Our loving subjects We are desirous of conferring upon him a style and dignity appropriate to his rank and station NOW KNOW YE that we of Our especial grace certain knowledge and mere notion do by these Presents give and grant unto His Royal Highness Philip Duke of Edinburgh the Style and Titular Dignity of a Prince of the United Kingdom of Great Britain and northern Ireland to have and at all times to hold and enjoy the said style and titular Dignity in addition to any other titles of honour salon to him belong or at any time hereafter may belong Our Will and Pleasure further is that Our Earl Marshal of England or his Deputy for the time being do cause these Our Letters or the enrol meat thereof to be recorded in Our College) of Arms to the end that Our Officers of Arms and all all others may take due notice thereof In Witness whereof We have caused these Our Letters to be made Patent Witness Ourself at Westminster the twenty-second day of February in the sixth year of Our Reign. The Queen has been pleased by Letters Patent under the Great Seal of the Realm bearing date 22nd February 1957, to give and grant unto His Royal Highness the Duke of Edinburgh, KG, KT, GBE, the style and titular dignity of a Prince of the United Kingdom of Great Britain and Northern Ireland. The Queen has been pleased to declare her will and pleasure that his Royal Highness the Duke of Edinburgh shall henceforth be known as His Royal Highness The Prince Philip, Duke of Edinburgh. The armorial bearings of Her Royal Highness Princess Alice Duchess of Gloucester as widow of His Royal Highness the late duke have been approved by Her Majesty the Queen this being intimated to Garter King of Arms in a letter from Buckingham Palace dated 27 Oct 1981, The said armorial bearings are those of His Royal Highness the late duke of Gloucester impaling the paternal arms of Her Royal Highness as previously depicted in the marital arms entered in I80 page 196 save that they are marshaled upon a lozenge ensigned by Her Royal Highness’s coronet and supported by the supporters borne and used by His Royal Highness the Duke of Gloucester in his lifetime. See the note on the children of the Earl of Wessex. The KING has been graciously pleased, by Warrant under His Majesty's Royal Sign Manual, to give and grant unto His Highness Prince Adolphus Charles Alexander Albert Edward George Philip Louis Ladislaus, Duke of Teck, Knight Grand Cross of the Most Honourable Order of the Bath, Knight Grand Cross of the Royal Victorian Order, Companion of the Most Distinguished Order of Saint Michael and Saint George, Lieutenant-Colonel in the Army, His Royal Licence and Authority that he may relinquish the use of the style, title and attribute of "Highness," that he and his issue may relinquish the use of the styles, dignities, titles and honours of " Prince " and " Duke of Teck " and all other states, degrees, dignities, titles, honours or appellations in the Kingdom of Wurtemberg or German Empire to him or to them belonging, and the designation "of Teck," that he may take and use the surname Cambridge, and that such surname may be taken and used by his issue: Provided that the said Royal Concession and Declaration be recorded in His Majesty's College of Arms, otherwise the said Royal Licence and Permission to be void and of none effect. And to command that the said Royal Concession and Declaration be recorded in His Majesty's said College of Arms. Letters Patent have passed the Great Seal of the United Kingdom of Great Britain and Ireland conferring the dignities of Viscount, Earl and Marquess of the said "United Kingdom upon Colonel Sir Adolphus Charles Alexander Albert Edward George Philip Louis Ladislaus Cambridge, G.C.B., G.C.V.O., C.M.G. (formerly Duke of Teck), and the heirs male of his -body lawfully begotten, by his names, styles and titles of Viscount Northallerton in the county of York, Earl of Eltham and Marquess of Cambridge. The KING has been graciously pleased, by Warrant under His Majesty's Royal Sign Manual, to give and grant unto His Serene Highness Prince Alexander Augustus Frederick William Alfred George of Teck, Knight Grand Cross of the Most Honourable Order of the Bath, Knight Grand Cross of the Royal Victorian Order, Companion of the Most Distinguished Order of Saint Michael and Saint George, Companion of the Distinguished Service Order, Brevet Lieutenant-Colonel and temporary Brigadier-General in the Army, His Royal Licence and Authority that he and his issue may relinquish the use of the styles, dignities, titles and attributes of "Serene Highness" and of "Prince" and all other states, degrees, dignities, titles, honours or appellations in the Kingdom of Wurtemberg or German Empire to him or to them belonging, and the designation of "Teck," that he may take and use the surname Cambridge, and that such surname may be taken and used by his issue: Provided that the said Royal Concession and Declaration be recorded in His Majesty's College of Arms, otherwise the said Royal Licence and Permission to be void and of none effect. Letters Patent have passed the Great Seal of the United Kingdom of Great Britain and Ireland conferring the dignities of Viscount and Earl of the said United Kingdom upon Brigadier-General Sir Alexander Augustus Frederick William Alfred George Cambridge, G.C.B., G.C.V.O., C.M.G., D.S.O. (formerly Prince Alexander of Teck), and the heirs male of his body lawfully begotten, by his names, styles and titles of Viscount Trematon in the county of Cambridge, and Earl of Athlone. The KING has been graciously pleased, by Warrant under His Majesty's Royal Sign Manual, to give and grant unto His Serene Highness Prince Louis Alexander of Battenberg, Knight Grand Cross of the Civil Division and Knight Commander of the Military Division of the Most Honourable Order of the Bath, Knight Grand Cross of the Royal Victorian Order, Knight Commander of the Most Distinguished Order of Saint Michael and Saint George, Knight of Justice of the Order of Saint John of Jerusalem in England, Admiral in the Royal Navy, His Royal Licence and Authority that he and his issue may relinquish the use of the styles, dignities, titles and attributes of "Serene Highness" and of "Prince" and all other states, degrees, dignities, titles, honours or appellations in the Grand Duchy of Hesse or German Empire to him or to them belonging, and the designation "of Battenberg," that he may take and use the surname Mountbatten, and that such surname may be taken and used by his issue: Provided that the said Royal Concession and Declaration be recorded in His Majesty's College of Arms, otherwise the said Royal Licence and Permission to be void and of none effect. Letters Patent have passed the Great Seal of the United Kingdom of Great Britain and Ireland conferring the dignities of Viscount, Earl arid Marquess of the said United Kingdom upon Admiral the Right Honourable Sir Louis Alexander Mountbatten, G.C.B., G.C.V.O., K.C.M.G. (formerly Prince Louis of Battenberg), and the heirs male of his body lawfully begotten, by the names, styles and titles of Viscount Alderney in the county of Southampton, Earl of Medina and Marquess of Milford Haven. The KING has been graciously pleased, by Warrant under His Majesty's Royal Sign Manual, to give and grant unto His Highness Prince Alexander Albert of Battenberg. Knight Grand Cross of the Royal Victorian Order, Knight of Justice of the Order of Saint John of Jerusalem in England, Captain in the Army, His Royal Licence and Authority that he may relinquish the use of the style, title and attribute of "Highness," that he and his issue may relinquish the use of the style or title of " Prince" and all other states, degrees, dignities, titles, honours or appellations in the Grand Duchy of Hesse or German Empire to him or to them belonging, and the designation "of Battenberg," that he may take and use the surname Mountbatten, and that such surname may be taken and used by his issue: Provided that the said Royal Concession and Declaration be recorded in His Majesty's College of Arms, otherwise the said Royal Licence and Permission to be void and of none effect. Letters Patent have passed the Great Seal of the United Kingdom of Great Britain and Ireland conferring the dignities of Viscount, Earl and Marquess of the said United Kingdom upon Captain Sir Alexander Albert Mountbatten, G.C.V.O. (formerly Prince Alexander of Battenberg), and the heirs male of his body lawfully begotten, by his names, styles and titles of Viscount Launceston in the county of Cornwall, Earl of Berkhampsted and Marquess of Carisbrooke. The KING has been graciously pleased, by Warrant under His Majesty's Royal Sign Manual, to give and grant unto His Highness Prince Leopold Arthur Louis of Battenberg, Knight Grand Cross of the Royal Victorian Order, Captain in the Army, His Royal Licence and Authority that he may relinquish the use of the style, title and attribute of "Highness," that he and his issue may relinquish the use of the style or title of "Prince" and all other states, degrees, dignities, titles, honours or appellations in the Grand Duchy of Hesse or German Empire to him or to them belonging, and the designation "of Battenberg," that he may take and use the surname Mountbatten, and that such surname may be taken and used by his issue: Provided that the said Royal Concession and Declaration be recorded in His Majesty's College of Arms, otherwise the said Royal Licence and Permission to be void and of none effect. And to command that the said Royal Concession and Declaration be, recorded in His Majesty's said College of Arms. WHEREAS by Warrant under Our Sign Manual bearing date the fourteenth day of July last past We were graciously pleased to give and grant unto Our dear Cousin His Highness Prince Leopold Arthur Louis of Battenberg, Knight Grand cross of Our Royal Victorian Order, Captain in Our Army, our Royal Licence and Authority that he might relinquish the use of the style title and attribute of "Highness" that he and his issue might relinquish the style and title of "Prince" and all other states degrees dignities titles honors or appellations in the Grand Duchy of Hesse or German Empire to him or to them belonging and the designation "of Battenberg", that he might take and use the surname Mountbatten and that such surname might be taken and used by his issue. KNOW YE THEREFORE that in the exercise of Our Royal Prerogative We do hereby declare Our Royal Will and Pleasure that Our said dear Cousin Sir Leopold Arthur Louis Mountbatten shall upon all occasions have hold and enjoy the same style title place preeminence and precedence as the younger son of a Marquess of the United Kingdom of Great Britain and Ireland. Our Will and Pleasure therefore is that you Edmund Bernard Talbot (commonly called Lord Edmund Bernard Talbot) Deputy to Our said Earl Marshal to whom the cognizance of matter's of this nature doth properly belong do see this Our Order observed and kept, and that you do cause these Presents to be egistered in Our College of Arms, and for so doing this shall be your Warrant. Given at Our Court at Saint James's this eleventh day of September, 1917 in the eighth year of Our Reign. The KING has been graciously pleased by Warrant under His Majesty's Royal Sign Manual to declare and ordain that Sir Leopold Arthur Louis Mountbatten, Knight Grand Cross of the Royal Victorian Order, Captain in the Army, shall henceforth have, hold and enjoy upon all occasions the same style, title, place, pre-eminence and precedence as the younger son of a Marquess of the United Kingdom of Great Britain and Ireland. And to command that the said Royal Concession and Declaration be recorded in His Majesty's College of Arms. The KING has been graciously pleased by Warrant under His Majesty's Royal Sign Manual, to ordain and declare that Albert Edward Wilfred, Count Gleichen, K.C.V.O., C.B., C.M.G., D.S.O., shall henceforth have, hold and enjoy place, pre-eminence and precedence next to and immediately before Marquesses of England; that Sylvia Gay, wife of the said Albert Edward Wilfred, Count Gleichen, shall henceforth have, hold and enjoy place, pre-eminence and precedence next and immediately before Marchionesses of England; and that Countess Feodora Georgina Maud Gleichen, spinster, Countess Victoria Alice Leopoldina Ada Laura, wife of Percy Wilfred Machell, Esquire, C.M.G., and Countess Helena Emily Gleichen, spinster, sisters of the said Albert Edward Wilfred, Count Gleichen, shall henceforth have, hold and enjoy place, pre-eminence and precedence next to and immediately before the daughters of Dukes of England. And to command that the said Royal Order and Declaration be recorded in His Majesty's College of Arms. GEORGE THE FIFTH by the Grace of God of the United Kingdom of Great Britain and Ireland and of the British Dominions beyond the Seas, King, Defender of the Faith, Emperor of India: To Our Trusty and Well-Beloved Edmund Bernard Talbot, Esquire, (commonly called Lord Edmund Bernard Talbot) Member of Our Royal Victorian Order, and Companion of the distinguished Service Order, Deputy to Our Right Trusty and Right Entirely Beloved Cousin Bernard Marmaduke, Duke of Norfolk, Earl Marshal and Our Hereditary Marshal of England, Greeting: Whereas by Royal Warrant bearing date the eleventh day of June One thousand nine hundred and thirteen. We did declare our Royal Will and Pleasure that Our dear Cousin Albert Edward Wilfred, Count Gleichen, Knight Commander of our Royal Victorian Order, Companion of Our Most Honourable order of the Bath, Companion of Our Most Distinguished Order of Saint Michael and Saint George and a Companion of the Distinguished Service Order, Major General in Our Army, and Sylvia Gay, Countess Gleichen, his wife, so long as she remains his wife or widow should thenceforth respectively have hold and enjoy, place, preeminence and precedence next to and immediately before Marquesses and Marchionesses of England, that our dear Cousins Countess Feodora Georgina Maud Gleichen. Countess Victoria Alice Leopoldina Ada Laura, widow and relict of Percy Wilfred Machell, Esquire, Companion of Our Most Distinguished Order of Saint Michael and Saint George, Companion of the Distinguished Service Order, Lieutenant-Colonel in Our Army, deceased, (therein with Our Royal Approbation styled Lady Valda Machell) and Countess Helena Emly Gleichen, sisters of the said Albert Edward Wilfred, Count Gleichen, should thenceforth have hold and enjoy place, preeminence and precedence next to and immediately before the daughters of Dukes of England: And whereas our said Cousins have petitioned Us that they may relinquish the place preeminence and precedence given to them by Our said Warrant, and that they and their issue may relinquish the use of the titles of Count and of Countess and any other states degrees dignities titles honours or appellations in the German Empire which may to them belong. Know ye therefore that having taken the same into Our Royal consideration and in exercise of Our Royal Prerogative We do hereby declare our Royal Will and Pleasure that Our said dear Cousin Albert Edward Wilfred, Count Gleichen, shall upon all occasions have hold and enjoy the same style, title, place, preeminence and precedence as the younger son of a Marquess of the United Kingdom of Great Britain and Ireland, that the said Sylvia Gay, Countess Gleichen, so long as she shall remain the wife or widow of the said Albert Edward Wilfred, Count G1eichen, and Our said Dear Cousins Countess Feodora Georgina Maud Gleichen, Countess Victoria Alice Leopoldina Ada Laura (styled Lady Valda Machell) and Countess Helena Emly Gleichen shall upon all occasions have hold and enjoy the same style title place preeminence and precedence as the daughters of a Marquess of the United. Kingdom of Great Britain and Ireland and that they all and their issue may relinquish the use of the said titles of Count and Countess and all other states degrees dignities titles honours or appellations in the German Empire which may to them belong. Our Will and Pleasure therefore is that you Edmund Bernard Talbot (commonly called Lord Edmund Bernard Talbot) Deputy to Our said Earl Marshal to whom the cognizance of matters of this nature doth properly belong, do see this our Order observed and kept, and that you do cause these Presents to be registered in Our College of Arms, And for so doing this shall be your Warrant. Given at Our Court at Saint James's this twelfth day of September, 1917 in the eighth year of Our Reign. BY HIS MAJESTY'S COMMAND. (Sd.) Geo. Cave. The KING has been graciously pleased by Warrant under His Majesty's Royal Sign Manual to give and to grant unto Albert Edward Wilfred, Count Gleichen, Knight Commander of the Royal Victorian Order, Companion of the Most Honourable Order of the Bath, Companion of the Most Distinguished Order of Saint Michael and Saint George, and a Companion of the Distinguished Service Order, Major-General in the Army, and to Sylvia Gay, Countess Gleichen, his wife, and to Countess Feodora Georgina Maud Gleichen, to Countess Victoria Alice Leopoldina Ada Laura (styled Lady Valda Machell), widow and relict of Percy Wilfred Machell, Esquire, Companion of the Most Distinguished Order of Saint Michael and Saint George, Companion of the Distinguished Service Order, Lieutenant-Colonel in the Army, deceased, and to Countess Helena Emly Gleichen, sisters of the said Albert Edward Wilfred, Count Gleichen, His Royal Licence and Authority, that they may relinquish the place, preeminence and precedence given to them respectively by Royal Warrant bearing date the 11th day of June, 1913, and to declare His will and pleasure that the said Albert Edward Wilfred, Count Gleichen, shall upon all occasions have, hold and enjoy the same style, title, place, preeminence and precedence as the younger son of a Marquess of the United Kingdom of Great Britain and Ireland, that the said Sylvia Gay, Countess Gleichen, so long as she shall remain the wife or widow of the said Albert Edward Wifred, Count Gleichen, and the said Countess Feodora Georgina Maud Gleichen, Countess Victoria Alice Leopoldina Ada Laura (styled Lady Valda Machell), and Countess Helena Emly Gleichen, shall upon all occasions have, hold and enjoy the same style, title, place, preeminence and precedence as the daughters of a Marquess of the United Kingdom of Great Britain and Ireland, and that they all and their issue may relinquish the use of the title of Count and Countess and all other states, degrees, dignities, titles, honours or appellations in the German Empire which may to them belong. Victoria by the Grace of God of the United Kingdom of Great Britain and Ireland Queen Defender of the Faith To All to whom these Presents shall come, sendeth Greeting! Whereas by an Act of Parliament intituled "An Act for the better regulating the future marriages of the Royal Family" it is amongst other things enacted "That no Descendant of the Body of His Majesty King George the Second, Male or Female (other than the issue of Princesses who have married, or may hereafter marry into Foreign Families) shall be capable of contracting Matrimony without the previous consent of His Majesty, His Heirs or Successors, signified under the Great Seal" Now Know Ye that We have consented, and do by these Presents signify Our Consent to the contracting of Matrimony between Our Dear Cousin His Royal Highness The Prince Ernest Augustus WIlliam Adolphus George Frederick Duke of Cumberland and Teviotdale, Earl of Armagh, Knight of Our Most Noble Order of the Garter, and Her Royal Highness Thyra Amélie Caroline Charlotte Anne daughter of His Majesty the King of Denmark. In Witness whereof We have caused Our Great Seal to be affixed to these Presents. Given at Our Court at Saint James's the Twenty Seventh Day of September 1878 in the Forty Second Year of Our Reign. (As registered in the College of Arms, mss I series, vol. 66, p. 200; reproduced with kind permission of the College of Arms). Victoria by the Grace of God of the United Kingdom of Great Britain and Ireland Queen Defender of the Faith To All to whom these Presents shall come, sendeth Greeting! Whereas by an Act of Parliament intituled "An Act for the better regulating the future marriages of the Royal Family" it is amongst other things enacted "That no Descendant of the Body of His Majesty King George the Second, Male or Female (other than the issue of Princesses who have married, or may hereafter marry into Foreign Families) shall be capable of contracting Matrimony without the previous consent of His Majesty, His Heirs or Successors, signified under the Great Seal". Now Know Ye that We have consented, and do by these Presents signify Our Consent to the contracting of Matrimony between Our Dear Cousin Her Royal Highness The Princess Frederica Sophia Maria Henrietta Amelia Theresa of Hanover, Princess of Great Britain and Ireland and Luitbert Alexander GeorgeLionel Alphonse Freiherr von Pawel Rammingen. In Witness whereof We have caused Our Great Seal to be affixed to these Presents. Given at Our Court at Saint James's the Eighteenth Day of March 1880, In the Forty Third Year of Our Reign. The marriage of her Royal Highness the Princess Frederica Sophia Maria Henrietta Amelia Theresa of Hanover, Princess of Great Britain and Ireland, elder daughter of His Majesty the late king George V. of Hanover, with Luitbert Alexander George Lionel Alphonse, Freiherr von Pawel Rammingen, was solemnized at 3 o'clock on Saturday in the private chapel within Windsor Castle. The ceremony of the marriage of her Royal Highness the Princess Frederica of Hanover (Princess of Great Britain and Ireland) with the Freiherr von Pawel Rammingen, was celebrated by the bishop of Oxford, inthe private chapel at Windsor Castle, at 3 o'clock this day, in the presence of Her Majesty the Queen. At the Court at Windsor, the 15th day of May, 1900. HER Majesty was this day pleased to declare Her Consent to a Contract of Matrimony between Princess Marie Louise Victoria Carolina Amelia Alexandra Augusta Frederica born Princess of Great Britain and Ireland and Princess of Brunswick daughter of His Royal Highness the Duke of Cumberland and His Grand Ducal Highness Prince Maximilian Alexander Frederic William Nephew of His Royal Highness the Grand Duke of Baden, which Consent Her Majesty has caused to be signified under the Great Seal and to be entered in the books of the Privy Council. At the Court at Buckingham Palace, the 7th day of March, 1904. PRESENT, The KING'S Most Excellent Majesty in Council. HIS MAJESTY was this day pleased to declare His consent to a contract of matrimony between Her Royal Highness Princess Alexandra Louise Maria Olga Elisabeth Thérèse Wera, born Princess of Great Britain and Ireland, Duchess of Brunswick and Luneburg, daughter of His Royal Highness the Duke of Cumberland, and His Royal Highness Prince Friedrich Franz IV, Grand Duke of Mecklenburg-Schwerin, which consent His Majesty has caused to be signified under the Great Seal and to be entered in the Books of the Privy Council. GEORGE THE FIFTH, by the Grace of God, of the United Kingdom of Great Britain and Ireland and the British Dominions beyond the Seas King, Defender of the Faith, to all to whom these Presents shall come sendeth Greeting! NOW KNOW YE that We have consented, and do by these Presents signify Our Consent to the contracting of Matrimony between His Royal Highness Prince Ernest Augustus Christian George, born Prince of Great Britain and Ireland, Duke of Brunswick and Luneburg, only surviving son of His Royal Highness The Duke of Cumberland and Teviotdale, K.G., and Her Royal Highness Princess Victoria Louise Adelaide Mathilde Charlotte, born Princess of Prussia, only Daughter of His Majesty The German Emperor, King of Prussia, K.G. Given at Our Court at Buckingham Palace the Seventeenth day of March, 1913, in the Third Year of Our Reign. BY THE KING OF GREAT BRITAIN, IRELAND, AND THE BRITISH DOMINIONS BEYOND THE SEAS. SIGNED WITH HIS OWN HAND..
At the Court at Buckingham Palace, the 17th day of March, 1913. HIS MAJESTY was this day pleased to declare His Consent to a Contract of Matrimony between His Royal Highness Prince Ernest Augustus Christian George, born Prince of Great Britain and Ireland, Duke of Brunswick and Luneburg, only surviving son of His Royal Highness The Duke of Cumberland and Teviotdale, K.G, and Her Royal Highness Princess Victoria Louise Adelaide Mathilde Charlotte, born Princess of Prussia, only daughter of His Majesty The German Emperor, King of Prussia, K.G., which Consent His Majesty has caused to be signified under the Great Seal, and to be entered in the Books of the Privy Council. At the Court at Sandringham, the 26th day of December, 1937. His Royal Highness The Duke of Gloucester. His Royal Highness The Duke of Kent. Earl of Athlone. HIS MAJESTY was this day pleased to declare His Consent to a Contract of Matrimony between Her Royal Highness Princess Frederica Louisa of Brunswick-Luneburg, and His Royal Highness Prince Paul of Greece, which Consent His Majesty has caused to be signified under the Great Seal and to be entered in the Books of the Privy Council. GEORGE THE SIXTH, by the Grace of God, of Great Britain, Ireland, and the British Dominions beyond the Seas King, Defender of the Faith, to all to whom these Presents shall come sendeth Greeting! NOW KNOW YE that We have consented, and do by these Presents signify Our Consent to the contracting of Matrimony between His Royal Highness Prince Ernest Augustus George William Christian Louis Francis Joseph Nicholas Oscar of Hanover, born Prince of Great Britain, Duke of Brunswick and Luneburg, son of His Royal Highness Prince Ernest Augustus, Duke of Brunswick-Luneburg, and Her Highness Princess Ortrud Bertha Adelaide Hedwig of Schleswig-Holstein-Glücksburg. Given at Our Court at Buckingham Palace the 1st day of August, 1951, in the Fifteenth Year of Our Reign. This last document is rather odd. Prince Ernst August was born before the letters patent of 1914 which declared that his designation should be "Prince of the United Kingdom of Great Britain and Ireland." Thus, if he was a "born Prince of Great Britain", it was not by virtue of the letters patent of 1914. This style is certainly consistent with the custom that prevailed until 1917, but one wonders why the style of Prince to which he was entitled by custom at birth was not revoked by the letters patent of 1917, and why the style that undoubtedly belonged to him (the letters patent of 1914 being unrevoked) was not used instead. Her Majesty was this day pleased, in pursuance of the Royal Marriages Act 1772, to declare Her Consent to a Contract of Matrimony between His Royal Highness Prince Ernst August Georg of Brunswick-Luneburg and Her Serene Highness Countess Monika of Solms-Laubach, which Consent Her Majesty has caused to be signified under the Great Seal and to be entered in the Books of the Privy Council. Her Majesty was also pleased, under the said Act, to declare Her Consent to a Contract of Matrimony between His Royal Highness Prince Ernst August Albert of Hanover and Chantal Hochuli, which Consent also Her Majesty has caused to be signified under the Great Seal and to be entered in the Books of the Privy Council. Her Majesty was this day pleased, in pursuance of the Royal Marriages Act 1772, to declare Her Consent to a contract of Matrimony between His Royal Highness Prince Ludwig Rudolph Georg Wilhelm Philipp Friedrich Wolrad Maximilian of Hanover and Her Serene Highness Countess Ysabelle Maria Elisabeth Thurn and Valsassina-Como and Vercelli, which Consent Her Majesty has caused to be signified under the Great Seal and to be entered in the Books of the Privy Council. What follows are the styles of the heirs apparent between 1714 and the present as they appear in the letters patent creating them as Princes of Wales. For most I only have the gazetting of the letters patent, but in two instances (1841 and 1911) I have the full text of the letters patent. However, it seems likely that the styles as they are gazetted are taken directly from the letters patent. His Majesty has been pleased by Letters Patent under the Great Seal of Great Britain to create His Royal Highness George Augustus (Prince of Great Britain, Electoral Prince of Brunswick-Lunenburgh, Duke of Cornwall and Rothesaye, Duke and Marquis of Cambridge, Earl of Milford Haven, and of Carreck, Viscount North-Allerton, Baron of Tewkesbury and of Renfrew, Lord of the Isles, and Steward of Scotland, and Knight of the most Noble Order of the Garter) Prince of Wales and Earl of Chester. His Majesty has been to order Letters Patent to pass under the Great Seal of Great Britain, for creating His Royal Highness Frederick Lewis (the Prince of Great Britain, Electoral Prince of Brunswick-Lunenburgh, Duke of Conrwall and Rothesaye, Duke of Edinburgh, Marquis of the Isle of Ely, Earl of Eltham, Viscount of Lanceston, Baron of Snaudon and of Renfrew, Lord of the Isles and Steward of Scotland, and Knight of the most Noble Order of the Garter) Prince of Wales and Earl of Chester. [...] His royal Highness George William Frederick (The Prince of Great Britain, Electoral Prince of Brunswick Lunenburgh; Duke of Edenburgh; Marquess of the Isle of Ely; Earl of Eltham; Viscount of Lanceston; Baron of Snaudon; and Knight of the Most Noble Order of the Garter), Prince of Wales and earl of Chester. [...] His Royal Highness the Prince of Great Britain, (Electoral Prince of Brunswick Lunenburgh, Duke of Cornwall and Rothesay, Earl of Carrick, Baron of Renfrew, Lord of the Isles, and Great Steward of Scotland), Prince of Wales, and earl of Chester. Victoria, by the grace of God, of the United Kingdom of Great Britain and Ireland, Queen, Defender of the Faith. Know ye, that we have made and created, and by these our letters patent do mate and create, our most dear Son, the Prince of the United Kingdom of Great Britain and Ireland (Duke of Saxony, Duke of Cornwall and Rothsay, Earl of Carrick, Baronof Renfrew, Lord of the Isles, and Great Steward of Scotland), Prince of Wales and Earl of Chester; and to the same, our most dear Son, the Prince of the United Kingdom of Great Britain and Ireland, have given and granted, and by this our present Charter do give, grant, and confirm, the name, style, title, dignity, and honour of the same Principality and Earldom, and him, our said most dear Son, the Prince of the United Kingdom of Great Britain and Ireland, as has been accustomed, we do ennoble and invest with the said Principality and Earldom, by girting him with a sword, by putting a coronet on his head, and a gold ring on his finger, and also by delivering a gold rod into his hand, that he may preside there, and may direct and defend those parts. To hold to him and his heirs Kings of the United Kingdom of Great Britain and Ireland for ever, wherefore we will and strictly command for us, our heirs, and successors, that our said most dear Son, the Prince of the United Kingdom of Great Britain and Ireland may have the name, style, title, state, dignity, and honour of the Principality of Wales and Earldom of Chester aforesaid, unto him and his heirs Kings of the United Kingdom of Great Britain and Ireland, as is abovementioned. In witness whereof, we have caused these our letters to be made patent. Witness ourself at Westminster this 8th day of December,1841. The Queen has been pleased to order letters patent to be passed under the Great Seal, for creating His Royal Highness the Prince of the United Kingdom of Great Britain and Ireland (Duke of Saxony, Duke of Cornwall and Rothsay, Earl of Carrick, Baron of Renfrew, Lord of the Isles, and Great Stewart of Scotland), Prince of Wales and Earl of Chester. (Times, Dec 8, 1841, p. 4A). The following passsage is quoted by The Complete Peerage, vol. 14, to deny that the issue of Queen Victoria and Prince Albert were validly dukes and duchesses of Saxony. While interesting, the passage is certainly not conclusive, all the more since the house laws of Saxe-Coburg and Gotha give the children of Queen Victoria and Prince Albert the very title that Greville deems "very absurd". December 5th. The difficulties and trouble that may be caused by trifles may be well illustrated by a matter which is now pending. Peel sent for me the day before yesterday, to talk to me about the armorial bearings of the Prince of Wales, a matter apparently very simple and insignificant, but not at all so in fact. The Queen and Prince are very anxious to allot to this Baby his armorial bearings, and they wish that he should quarter the arms of Saxony with the Royal arms of England, because Albert is alleged to be Duke of Saxony. She gave the Princess Royal armorial bearings last year by warrant, but it is conceived that more formal proceedings are necessary in the case of the Heir Apparent. The last precedent is that of 1714, when George the First referred to the Privy Council the question of the Prince of Wales's arms, who reported to H.M. thereupon. On that occasion the initiative was taken by the D<eputy> E<arl> Marshal, who transmitted to the Council a draft, which was afterwards approved. There, however, the case admitted of no doubt; but now the Heralds (and others who have considered the matter) think that the Saxon arms ought not to be foisted upon the Royal arms of England. It is her inveterate predilection for everything German (a disagreeable peculiarity in her character) which makes her insist on this being done, and she wants it to be done offhand at the next Council without going through the usual forms of a reference and report. Peel, however, is not disposed to let the thing be thus hurried over; he thinks that it is a matter in which the dignity of the Crown is concerned, and that whatever is done should be done with deliberation, and that if the Privy Council are to advise, they ought to advise what is right and becoming, and not merely what She and the Prince wish. The difficulty, therefore, is, how to set the matter going. The Earl Marshal will not stir without an order to do so. If the Home Office order him to submit a draft of the armorial bearings of the Prince of Wales, they can only order him to make out what is right according to the rules and laws of Heraldry, and the Earl Marshal is of opinion that what the Q. and Prince wish to be done is inconsistent with those rules. The matter therefore remains in suspense. I have sent to Wharncliffe, by Peel's desire, to come up from Wortley to meet Graham, in order that they may put their heads together and settle this delicate and knotty affair. Melbourne would have made very light of it; he would have thought it did not signify a straw (which, in fact, it does not) and that any fancy the Queen had should be gratified in the most summary way. December 8th. This foolish business of the coat of arms has cost more trouble than many matters a thousand times more important. Peel has had to write at least a dozen long letters about that and the alteration in the Liturgy, and whether H.R.H. should be inserted before P. of W. Yesterday Wharncliffe, Graham, and I had a conference at the Home Office, when Graham produced a letter from Peel, with one from the Queen to him, pressing for the speedy arrangement of this affair, and treating it as a thing settled. Graham said it was not worth while to squabble about it, and better to gratify her, and he proposed to take it on himself, let the Council have nothing to do with it, but, on his own responsibility, order the E<arl> M<arshal> to draw out a Coat of arms, with the achievement according to her wishes, no matter whether right or wrong. We agreed this was the best way. Peel had written to me about the Liturgy, and I wrote him word that when Albert's name was inserted, the Archbishop particularly desired there might be no 'Royal Highness,' and so it was left out. December 9th. Saw Graham again yesterday about this business. They have gazetted the child 'Duke of Saxony,' which is very absurd, and at Lady Holland's, last night, the precedence given to that title over the English titles was much criticised. 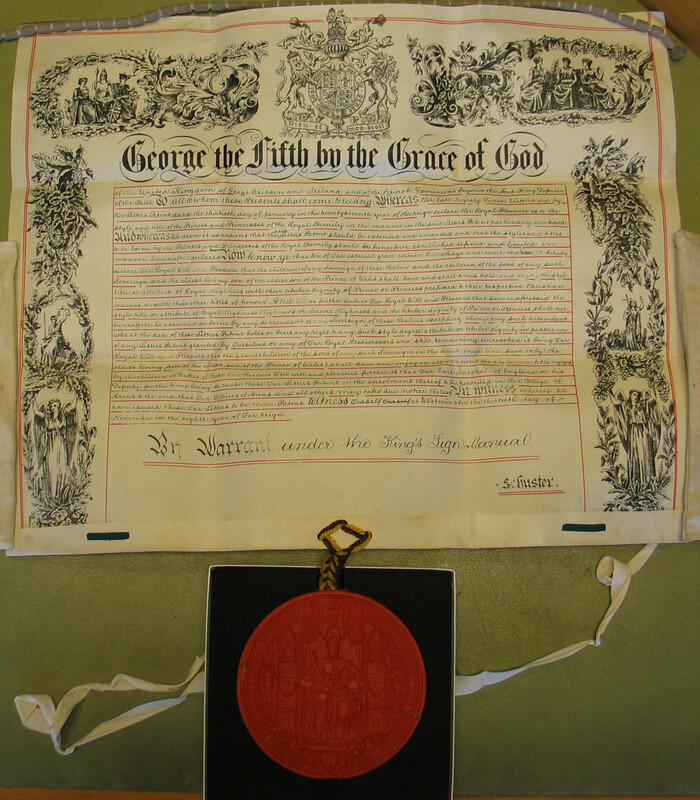 His Majesty has been to order Letters Patent to be passed under the Great Seal of Great Britain, for creating His Royal Highness Prince George Frederick Ernest Albert, Duke of Cornwall and York (Duke of Rothesay, Prince of Saxe-Coburg and Gotha, and Duke of Saxony, Earl of Carrick and Inverness, Baron of Renfrew and Killarney, Lord of the Isles and Great Steward of Scotland), KG, KT, KP, GCMG, GCVO, Prince of Wales and Earl of Chester. (Times, Nov 11, 1901, p. 9E, quoting the Gazette). George the Fifth, by the Grace of God of the United Kingdom of Great Britain and Ireland and of the British Dominions beyond the Seas, King, Defender of the Faith. To all Archbishops, Dukes, Marquesses, Earls, Viscounts, Bishops, Barons, Baronets, Knights, Justices, Provosts, Ministers, and all other Our Faithful Subjects, greeting. Know ye that We have made and created and by these Our Letter Patent do make and create Our Most Dear Son, Edward Albert Christian George Andrew Patrick David, Prince of the United Kingdom of Great Britain and Ireland, Duke of Cornwall and Rothesay, Earl of Carrick, Baron of Renfrew, Lord of the Isles, and Grand Steward of Scotland, Duke of Saxony and Prince of Saxe-Coburg and Gotha, Prince of Wales and Earl of Chester, and to the same, Our Most Dear Son Edward Albert Christian George Andrew Patrick David, have given and granted. And by this our present Charter do give, grant, and confirm the name, style, title, dignity and honour of the same Principality and Earldom, and Him Our said Most Dear Son Edward Albert Christian George Andrew Patrick David as has been accustomed We do ennoble and invest with the said Principality and Earldom by girding Him with a sword, by putting a coronet on His head, and a gold ring on his finger, and also by delivery a gold rod into his hand, that he may preside there and may direct and defend those parts to hold to him and his heirs Kings of the United Kingdom of Great Britain and Ireland and of the British Dominions beyond the Seas for ever. Wherefore We will and strictly command for Us, our heirs and successors, that Our said most dear son, Edward Albert Christian George Andrew Patrick David may have the name, style, title, dignity, and honour of the Principality of Wales and Earldom of Chester aforesaid unto him and his heirs Kings of the United Kingdom of Great Britain and Ireland and of the British Dominions beyond the Seas as is above mentioned. In witness whereof We have caused these Our Letters to be made Patent. Witness Ourself at Westminster the 23rd of June in the first year of Our reign. (Times, July 5, 1911, p. 8C). Trusty and Well-beloved, We Greet You well. Whereas the Sons and Descendents of Our Royal Ancestors and Predecessors Kings of England, and other Noble Persons, who, for the Eminence of their Extraction and Merits, are, and have been Dignified with the titles of Dukes, Marquisses, Earls and Viscounts, have borne and used several sorts of Coronets and Circlets, as particular Distinctions of their respective Dignities and Degrees; the which notwithstanding, have not been so established, but that they have in several Ages admitted of Alteration; Wherefore We having observed, that the Coronets used by those of Our Royal Family, have not been enough distinguished from those used by others. We have thereupon found it fit and necessary so to settle and establish the use and bearing of such Coronets as may not only evidencec the just Esteem We have for those of Our Royal Family, but as may in all Times herafter Distinguish such from others, though of Eminent Birth and Equal Titles with them. Our Will and Pleasure therefore is, That the Son and Heir Apparent of the Crown for the time being, shall use and bear his Coronet composed of Crosses and Flower-de-Lized with one Arch; and in the midst a Ball and Cross, as hath our Royal Diadem; and that Our most Dear and most Entirely-beloved Brother James Duke of York, and so all the immediate Sons of Our Self, and the immediate Sons and Brothers of Our Successors Kings of England, shall bear and use his and their Coronets composed of Crosses and Flower-de-Liz only; but that all their Sons respectively, having the Title of Dukes, shall bear and use their Coronets composed of Crosses and Flowers or Leaves, such as are used in the Composure of the Coronets of Dukes not being of Our Royal Family; hereby Commanding you our Principal Herald and King of Arms of Our Order, and your Successors respectively in the said Office, to Emblason and set forth the Arms in all Achievements whatsoever of the Son and Heir Apparent of the Crown for the time being, of Our Said most Dear and most Entirely-Beloved Brother James Duke of York, and of all other Descended of Our Royal Family, in such manner as is hereby expressed and directed. And that you forthwith cause an Entry to be made in the Publick Register in Our Office of Arms of this Our Will and Pleasure; to the End, you and all others whom it may concern, may duely execute and observe the same; And for your so doing, this shall be your sufficient Warrant and full Authority. Given under Our Signet at Our Court at Whitehall, this 9th Day of February, in the 13th Year of Our Reign. (as recorded in the College of Arms, mss series I, vol. 25, p. 86; with kind permission of the College of Arms. Trusty and well-beloved we greet you well and do hereby signify unto you that having thought fit to give and assign unto our most dear cousin and brother-in-law Prince Adolphus Charles Alexander Albert Edward George Philip Louis Ladislaus Duke of Teck, Knight Grand Cross of the Most Honourable Order of the Bath, Knight Grand Cross of the Royal Victorian Order, and Companion of the Most Distinguished Order of Saint Michael and St George, Arms, crest, supporters and coronet to be borne and used by HH on all occasions, We do hereby declare and ordain that Our said Most dear Cousin and Brother-in-law shall use and bear for his arms: Quarterly in the first and fourth quarters the arms of our dear cousin the Princess Mary of Cambridge (Duchess of Teck) ad in the second and third quarters the arms of HH Francis Prince and Duke of Teck both deceased being the father and mother of the said most dear cousin and brother-in-law together with his paternal crest and supporters And Whereas We by Royal Warrant bearing date the 19th day of June last did declare and ordain that Our said Most dear Cousin and Brother-in-law should henceforth be styled, entitled and called His Highness And Whereas no Coronet befitting such style and title has heretofore been constituted and ordained by Us or Our Royal Predecessors We do hereby declare and ordain that Our said Most dear Cousin and Brother-in-law shall bear and use surmounting his Arms a Coronet composed of Fleurs-de-lys and strawberry leaves; And We do further ordain and declare that a Coronet in form as aforesaid shall henceforth constitute the Coronet appertaining to the style dignity and title of Highness: And We do further declare and ordain that such Arms, Crest and supporters shall be borne and used by his issue with due and proper differences according to the laws of Arms, and We do further command and authorize you and your successors in office respectively to set forth upon all occasions in conformity with the Laws of Arms for Our said Most dear Cousin and Brother-in-law and his issue the aforesaid Arms crest and supporters as in the painting hereunto annexed are more plainly depicted And We command you to cause this Our Warrant to be recorded in Our College of Arms Whereof you are not to fail. For which this shall be your warrant. Given at Our Court at Buckingham Palace this 6th day of November 1911 in the 2nd year of our Reign. Trusty and well beloved we greet you well and do hereby signify unto you that whereas by royal warrant bearing date the 9th day of Feb 1661 his late majesty king Charles the second was pleased to assign certain coronets to be from henceforth borne and used by members of the royal family that is to say, by the son and heir apparent of the sovereign and his successors a coronet composed of crosses and fleurs-de-lis with one arch and in the midst a ball and cross as in the royal crown; by the immediate sons other than the heir apparent and by the brothers of the sovereign and of his successors a coronet composed of crosses and fleurs de lis only; by all the sons respectively having the title of duke of the immediate sons and of the brothers of the sovereign and his successors a coronet composed of crosses and flowers or leaves such as are used in the composure of the coronets of dukes; and whereas the said royal warrant did not determine establish or assign any coronets to be borne and used by the immediate daughters and sisters of the sovereign or by the sons not having the rank of duke or the daughters of the son and heir apparent of the sovereign or by the sons not having the rank of duke and by the daughters of the sons (other than the heir apparent) or of the brothers of the sovereign or by the sons and daughters of the daughters and of the sisters of the sovereign and no such coronets have heretofore been assigned in any general warrant though from time to time by individual royal warrants we and our royal predecessors have on occasion thought fit to assign coronets to these: We now having taken this matter into our consideration do declare our royal will and pleasure and assigned to the immediate daughters and sisters of ourselves and of our successors a coronet composed of four crosses pattee and four fleurs-de-lis and to all the sons and daughters of the son and heir apparent of us and of our successors a coronet composed of two crosses pattee four fleurs-de-lis and two strawberry leaves; and to the sons not bearing the rank of duke and to the daughters of the sons other than the heir apparent and of the brothers of us and of our predecessors and of our successors a coronet composed of four crosses pattee and four strawberry leaves; and to the sons and daughters of the daughters of us and of our predecessors and of our successors a coronet composed of four fleurs-de-lis and four strawberry leaves to be borne and used by them being subjects of these our realms, and we do further ordain and declare that the respective wives and widows of the persons entitled under this our royal warrant or under the aforesaid warrant of king Charles the Second may bear and use the coronet of their respective husbands. And we do further command and authorize you and your successors in office to set forth together with their arms upon all occasions respectively in conformity with the laws of arms the said coronets as are in the painting hereunto annexed more plainly depicted. and whereas by our royal warrant bearing date the 6th day of November 1911 we ordained and declared that a coronet in form as aforesaid composed of fleurs-de-lis and strawberry leaves should be borne and used by our most dear cousin and brother-in-law Adolphus Charles Alexander Albert Edward George Philip Louis Ladislaus now marquess of Cambridge and should constitute the coronet appertaining to the style dignity and title of Highness we do now hereby revoke in so far as the coronet is thereby assigned the said royal warrant and do command you to have due knowledge of this our revocation and we do command you to cause this our warrant to be recorded in our College of Arms whereof you are not to fail ; in which this shall be your warrant. Given at our Court of St James’s the 19th day of November 1917 in the 8th year of our reign. Trusty and Well beloved we greet you and do hereby signify unto you that Whereas His Majesty King George the 5th by Letters Patent bearing date the 30th day of November in the 8th year of his reign did declare his royal will and pleasure that the children of any sovereign of these realms and the children of the sons of any such sovereign and the eldest living son of the eldest son of the Prince of Wales should have and at all times hold and enjoy the style title or attribute of Royal Highness and whereas it hath been customary for us and our royal predecessors from time to time by warrant to assign armorial ensigns to those members of our royal family enjoying the style of Royal Highness and whereas it is our royal will and pleasure to make provision for the armorial ensigns of those members of our royal family and their descendants not enjoying the style of Royal Highness but being nonetheless lineally descended in the direct single line from any sovereign of these realms, we do hereby declare and ordain that the armorial ensigns assigned by Royal Warrant to any grandchild of a sovereign of these realms (excepting the eldest son of the Prince of Wales) shall henceforth become heritable by the descendants of such grandchild with due and proper differences according to the laws of arms we therefore require and command you and your successors in the office respectively to order marshal and set forth upon all occasions such armorial ensigns accordingly and we command you to cause this our warrant to be recorded in our college of arms whereof ye are not to fail, for which this shall be your warrant. Given at our Court in HM Yacht Britannia this 24th day of February 1975 in the 24th year of our reign.